Lamb rack is often seen as difficult to cook and can be an expensive mistake if things go wrong. Cooking lamb rack sous vide takes away the stress and gives a perfect result every time. It can also be cooked in advance and reheated in a pan when required, great for dinner parties and special Sunday lunches. Try putting different herbs and flavours in the bag with the lamb. Thyme, tarragon and garlic would all work well. If you prefer the meat a little more cooked increase the temperature of the water bath to 62°C for medium and leave the cooking time the same. 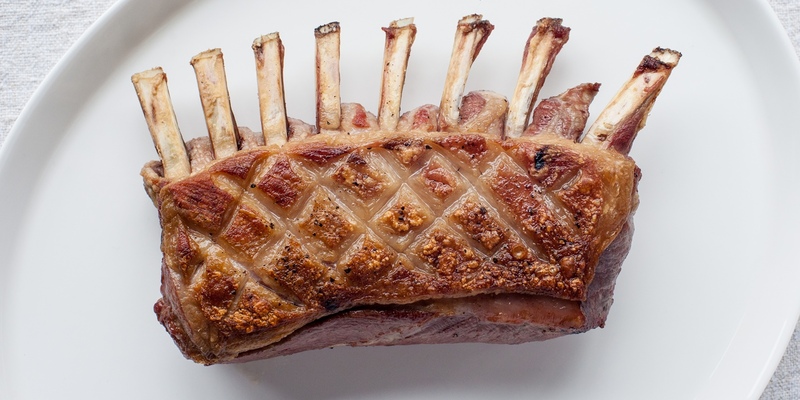 Dominic Chapman simply serves Lamb rack with crushed Jersey Royals and anchovy butter for a delicious spring supper but for something a little more challenging try Matt Gillan's Best end and shoulder of salt marsh lamb, red pepper, pineapple, mint oil and cobnuts.